SUBSTANTIAL DISCOUNTS on registration for the Fall Conference and registration to Members-Only events such as WinterFest, OPI or other programs held throughout the year. SCHOLARSHIPS AND AWARDS - members are eligible to receive scholarships for professional development and recognition of accomplishments. Awards include the ICTFL Paul T. Griffith Teacher of the Year Award, part of the ACTFL National Teacher of the Year program. The Fund for the Future Scholarship for pre-service and new teachers is designed to support new careers. SUBSCRIPTION TO ACCENTS / E-BLASTS - to keep you "up to date" and informed on foreign languages education, Illinois issues and Illinois language personalities. JOB POSTINGS are announced to members via our regular email Accents and are posted online. VOTING PRIVILEGES in the election of officers and at the business meetings where major policies and programs are adopted. STATEWIDE SERVICES AND REPRESENTATION through the Regional Board Members and Committees of ICTFL. OPPORTUNITIES TO SERVE THE PROFESSION by presenting at conferences, working on committees and at organization activities. LEADERSHIP DEVELOPMENT by serving on board committees as volunteer or in elected roles and in teacher leadership training. REPRESENTATION at Central States Conference on thee Teaching of Foreign Languages (CSCTFL) and American Council on the Teaching of Foreign Language (ACTFL). 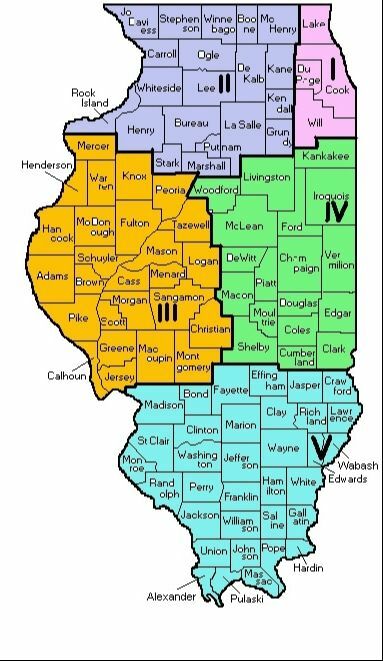 Within the ICTFL structure, the state of Illinois is divided into five regions (map below). Region One: Region One serves the counties of Cook, Du Page, Lake, and Will. Region Two: Region Two serves the counties of Boone, Bureau, Carroll, DeKalb, Grundy, Henry, Jo Daviess, Kane, Kendall, LaSalle, Lee, Marshall, McHenry, Ogle, Putnam, Rock Island, Stark, Stephenson, Winnebago and Whiteside. Region Three: Region Three serves the counties of Adams, Brown, Calhoun, Cass, Christian, Fulton, Greene, Hancock, Henderson, Jersey, Knox, Logan, Macoupin, Mason, McDonough, Menard, Mercer, Montgomery, Morgan, Peoria, Pike, Sangamon, Scott, Schuyler, Tazewell and Warren. Region Four: Region Four serves the counties of Champaign, Clark, Coles, Cumberland, DeWitt, Douglas, Edgar, Ford, Iroquois, Kankakee, Livingston, Macon, Moultrie, McLean, Piatt, Shelby, Vermillion and Woodford. Region Five: Region Five serves the counties of Alexander, Bond, Clay, Clinton, Crawford, Edwards, Effingham, Fayette, Franklin, Gallatin, Hamilton, Hardin, Jackson, Jasper, Jefferson, Johnson, Lawrence, Madison, Massac, Monroe, Perry, Pope, Pulaski, Randolph, Richland, St. Clair, Saline, Union, Wabash, Washington, Wayne, White, and Williamson.